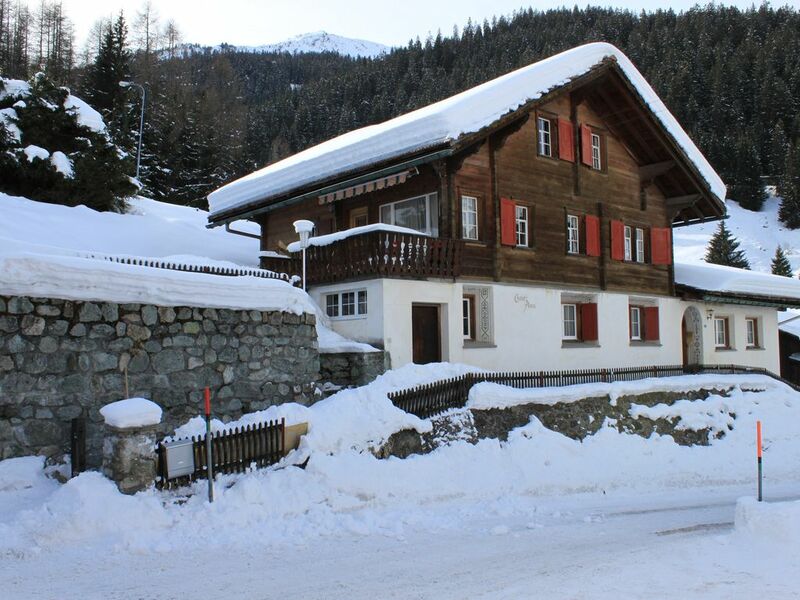 Our Chalet Anna was built in Graubünden style and has been gently renovated in recent years. It is just a 5-minute walk from the train station and therefore the center of Klosters and the Gotschna cable car, which leads directly to the Davos-Klosters ski area. Behind the house there is the ski lift Selfranga for families as well as in the summer the golf course and only 5 minutes in walking distance the big tennis center, the Klosters Arena. On two floors the house has 8 beds. Divided into 3 double rooms and two single rooms. Two double beds and 4 single beds. A bath renovated in 2016 with a bath and a separate shower and two sinks in the two single rooms and 2 toilets are spread over 2 floors. The kitchen has everything you need including raclette and fondue. A heated garage and 2 outdoor parking spaces are also included. In front of the house is a lawn with barbecue / barbecue facilities and a covered terrace in front of the entrance. The green areas behind and next to the house can be used as a playground. very comfortable for 6 people. kitchen small but very functional. a wonderful location-walking distance to shopping, rentals, ski hills and rest of switzerland! get your daily guest travel pass at the tourist office and travel on public trains and buses in Klosters and Davos. We had a marvelous time overall. Kitchen full of supplies and equipment , spacious rooms, nice views, easy access to food markets, fine restaurants, and, of course, visits to various Alpine destinations. Since we had our kids with their very young kids (1 and 3.5), not having a toilet upstairs was a bit difficult. It also took us a few days to figure out that there was a washer and dryer, but an unmarked key. I marked it assuming this was OK with the owner. We all wished we could have stayed even longer; write , enjoy the outdoors, and the kids loved all the toys. Mid-season was a great time for us also. Haus Anna ist zentral gelegen, das Einchecken hat mit der Schlüsselbox gut funktioniert. Im Haus war alles wie beschrieben, es hat genug Platz für 8 Personen am Esstisch. Wir haben unsere Ferien sehr genossen! Das Chalet war sauber und ist ruhig gelegen. Natürlich knarrt es in einem solchen Chalet immer ein wenig, doch das trägt zum Charm bei. Der Platz war ebenfalls ausreichend. Die Einfahrt zur Garage ist steil, doch für den Abstellplatz vor der Garage hat es entsprechende Stopper, die man unter die Autoräder legen kann. Sehr uriges grosses Chalet für zwei Familien ausreichend. Etwas umständlich mit den Gästekarten, ansonsten hat alles einwandfrei geklappt. Vielen Dank für die positive Bewertung. Die Gästekarten können vom Mieter nur bei dem Touristoffice selbst abgeholt werden. Wir sind dort als Gastgeber registriert. Ein Feriendomzil zum Wohlfühlen! Das Ambiente könnte besser nicht sein: Klosters wird von der Landquart durchflossen, hat sich - anders als Davos - seinen Charakter bewahrt. Gerne promeniert man durch den Ort, findet alles, was man braucht. Man kann das Auto stehen lassen. Vom Quartier aus kann man das Landquarttal aufwärts wandern und findet Erquickung für Seele und Leib. Mit der Bergbahn gelangt man hinauf zum Gotschnagrat (2293 m) und wird überwältigt von einem malerischen Panorama. Noch im August herrscht auf den Bergwiesen reiche Blüte. Das Bergrestaurant bietet schönen Ausblick und gute Speisen zu fairen Preisen. Im Haus fühlten wir uns von Anfang an wohl. Wenn es draußen nicht so schön wäre, würde man gerne im großen, hellen und gemütlichen Wohnraum sitzen bleiben, lesen, schreiben, spielen, Gespräche führen. In der kleinen Küche ist alles da, was man für Selbstverpflegung braucht. Zum Bäcker ist es nicht weit. Ein Traum: Frühstück bei Morgensonne auf der kleinen Terrasse vor dem Haus. und, wie uns scheint, die Lage an heilsamen Ort. Danke der Gastgebern, die alles so fein gestalteten und pflegen. We are really located in the center of Klosters-Platz and not like many other locations in Klosters-Serneus or far at a mountain. You can walk in 5 minutes to the center. No car needed. Bus station is 20 meters from the house away. Nicht Rollstuhl gerecht da 15 Stufen zum Eingang welche selbst geräumt werden müssen und daher keine Haftung im Falle eines Unfalls besteht.